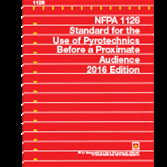 NFPA 1126: Standard for the Use of Pyrotechnics Before a Proximate Audience 2016 ed. Control hazards and save lives with the 2016 NFPA 1126: Standard for the Use of Pyrotechnics Before a Proximate Audience. In an instant, the excitement and drama of pyrotechnics can take a tragic turn, destroying lives and property. That's why compliance with NFPA 1126: Standard for the Use of Pyrotechnics Before a Proximate Audience is critical to the fire and life safety of operators, performers, support personnel, viewing audiences, buildings and equipment -- indoors or outdoors with a proximate audience. Application includes use in conjunction with theatrical, musical, or performing arts productions in theaters, stadiums, concert halls, and similar venues. Improve safety for both the audience and operators and reduce property damage with the 2016 edition. The use of hybrid flame effects has increased in recent years, and the 2016 NFPA 1126 responds to fire and life safety needs. The 2016 NFPA 1126 is an essential safety resource for protecting people and property wherever pyrotechnics are used for entertainment.